Up until today, I had never tasted a persimmon in my life. I was curious to know what persimmons were like, so I did a bit of research. Very ripe persimmons are light yellow-orange to deep orange-red in color and have the texture of pudding. 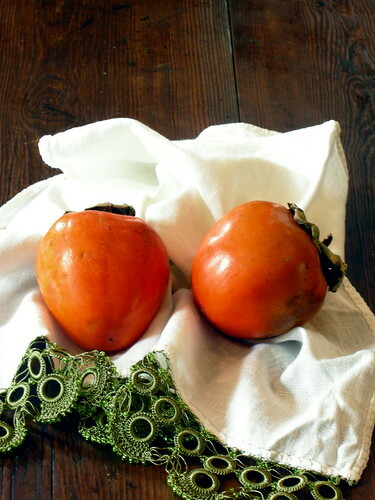 There are two types of persimmon, the astringent and the non-astringent variety, and you only want to eat the astringent variety, also known as a Hachiya, when it is very ripe. This cake is so lovely. Mellow, rich, and a bit spicy. I was lucky enough enough to taste it while it was still warm form the oven, and boy was it good. I am sure that it would be equally delicious if you heated it up in the microwave or even in the oven for a bit and then slathered it with honey and butter. 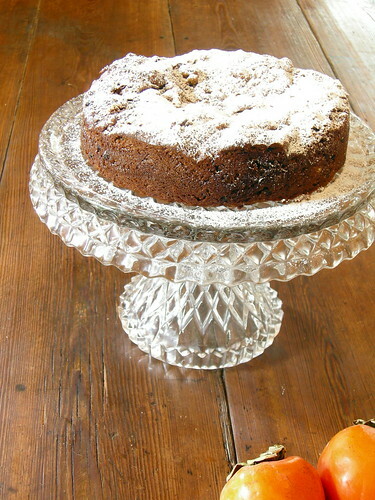 This cake could not have been simpler, but its flavor was anything but simple. I think it will even make its way into my usual repertoire. I suggest adding it to yours. Cut persimmons in half and scoop out pulpy flesh with a spoon. Puree pulp in a food processor or blender. Preheat oven to 350. 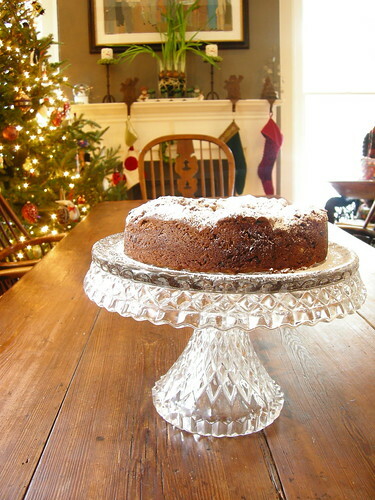 Line a 9-inch round cake pan with a circle of parchment paper. Cream butter and sugar until light and fluffy. Add vanilla and beat in eggs one at a time. Sift together flour, salt, baking soda, and cinnamon. Stir half the persimmon puree into creamed butter mixture then thoroughly mix in dry ingredients. Stir in remaining puree and walnuts, and currants with their liquor. Pour batter into prepared cake pan and bake about 45 minutes, until a toothpick inserted in the center comes out clean. Remove from oven and cool. Remove from pan and peel off parchment paper. 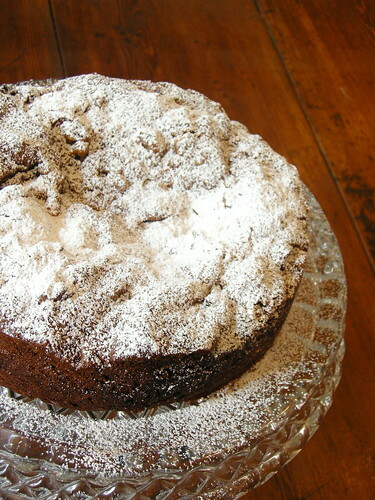 Dust with powdered sugar.